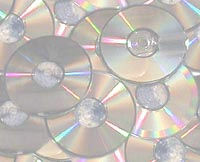 It looks like CDs and DVDs might be the victims of Spring Cleaning sessions in 2010. Apparently, spring cleans in 2010 are going deeper and further than they do in usual years according to research conducted to mark the launch of The Sims 3 Design & High-tech Stuff Pack. The urge to declutter is particularly strong this year due to the freezing cold spell at the beginning of 2010, which left people stuck inside the house for longer than usual, that and because it’s the beginning of a new decade. According to the report: Brits have cleared out £10.82billion worth of furnishings and material items already this year and the number of UK homes receiving a spring clean this year has increased by 24 per cent. One of the main areas for a spring clean is home entertainment with 34% of Brits clearing out DVDs and CDs more than any other items this year, motivated undoubtedly by the increase of new ways to store music and films. Well. Anyone ditching anything unusual this Spring?